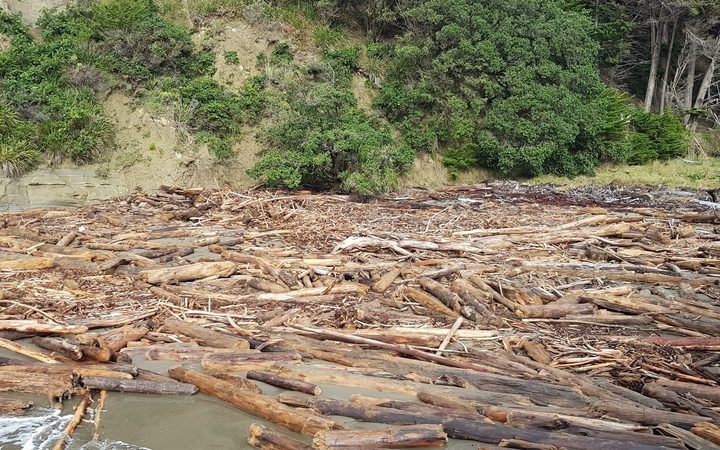 The Malaysian owner of a forestry company blamed for tonnes of debris washing up in Tolaga Bay has been fined twice for illegal logging overseas, but it took the Overseas Investment Office nine years to realise. The penalty could have affected Samling Group’s Hikurangi Forest Farm’s good character status, but the OIO decided it was too late to take any action. Separately, a Malaysian billionaire who owns another Tolaga Bay forestry company was granted 24 consents to buy sensitive land between 2005 and 2017, even though another of his companies has faced accusations of environmental and human rights abuses overseas since 2004. The admission of OIO’s tardy response to the Samling’s illegal logging fine has prompted calls for the OIO to beef up its monitoring of foreign investors and for changes to the way the good character test is applied. Hikurangi Forest Farms, owned by Malaysia’s Samling Group, was granted consent to buy 22ha of land in Gisborne in May 2007. Five months later one of Samling’s subsidiaries, Barama Company, was fined for illegal logging in Guyana. In January 2008 it was fined again. The Norwegian Pension Fund quit all its Samling investments in 2010 because of ethical concerns about its operations in Guyana and Malaysia and Samling’s palm oil operations in Myanmar were last year accused of illegal deforestation indigenous land grabs and environmental abuses by civil rights groups in that country. The OIO said it was aware of online reports of the company’s practices in Myanmar but it had not been able to verify them. It only became aware of the illegal logging fines in 2017. “After considering various matters, including limitation issues and the age of the fine, and how long ago Samling got OIO consent, we considered the fine was too long ago for us to act on this information alone,” Land Information New Zealand’s Overseas Investment Office manager Vanessa Horne said. That action could have included forcing the sale of assets owned by Samling. Meanwhile, a second Malaysian-owned company also implicated in the Tolaga Bay flooding, has continued to buy sensitive land in New Zealand despite its owners facing allegations of human rights and environmental abuses abroad. Ernslaw One, owned by Malaysia’s Tiong family, is one of the three companies whose activities are being investigated by the Gisborne District Council after the June floods. Its founder Tan Sri Tiong Hiew King made his fortune in forestry and palm oil plantations and his assets here included New Zealand King Salmon, Winstone Pulp and Neil Group. One of his logging companies Rimbunan Hijau faces accusations of illegal operations and human rights and environmental abuses in Papua New Guinea and Malaysia, first documented by Greenpeace in 2004, and more recently this month by the Oakland Institute. But it hasn’t affected his business in New Zealand with 24 consents to buy sensitive land being granted since 2005. The Tiong family has been investing in New Zealand for more than 20 years, with more than 90 approved consents to the companies controlled by the family, OIO’s Vanessa Horne said. “For the OIO to take enforcement action after consent has been granted for any breach of a good character condition, it would need to prove that a person is not fit to hold an asset. “We need to consider the nature of the allegation, the evidence of the allegation and the public interest in taking action, such as the impact on New Zealanders from taking action. The commission of an offence by a person may provide evidence as to whether they are fit to hold an asset. But this is not the only matter the OIO would need to consider,” she said. Both Samling and the Tiong family’s Rimbunan Hijau were yesterday named as irresponsible palm oil producers in a report published by Greenpeace. Campaign Against Foreign Control of Aotearoa (CAFCA) said the OIO’s good character test was not rigorous enough. “To prove companies are of good character representative of the company usually a New Zealand lawyer has to sign a bit of paper certifying they’re of good character – that’s it,” CAFCA spokesperson Murray Horton said. Council of Trade Unions policy director Bill Rosenberg said the test also only applied to individuals, not the company itself. But he would like to see that changed. East Coast environmental and indigenous rights advocate Tina Ngata said she was “appalled” to learn of the actions that Hikurangi Forest Farms and Ernslaw One’s parent companies were accused of in other countries. It was up to the OIO to monitor foreign investors more stringently and take action if necessary, she said. It was especially important where public money was used to clean up environments impacted by companies failing to follow good practices, she said. The OIO had nine permanent staff, up from just two in 2015, so it had more capacity to monitor and enforce consent conditions, including good character requirements, Vanessa Horne said. Oregon Group declined to comment, and several attempts to contact its Malaysian owner were unsuccessful. Hikurangi Forest Farms and its owner Samling could also not be reached for comment.